\(Origami^6\) is a unique collection of papers illustrating the connections between origami and a wide range of fields. 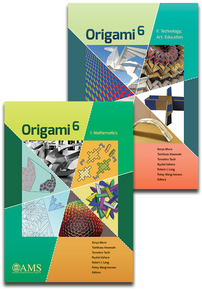 The papers compiled in this two-part set were presented at the 6th International Meeting on Origami Science, Mathematics and Education (10–13 August 2014, Tokyo, Japan). They display the creative melding of origami (or, more broadly, folding) with fields ranging from cell biology to space exploration, from education to kinematics, from abstract mathematical laws to the artistic and aesthetics of sculptural design. This two-part book contains papers accessible to a wide audience, including those interested in art, design, history, and education and researchers interested in the connections between origami and science, technology, engineering, and mathematics. Part 1 contains papers on various aspects of mathematics of origami: coloring, constructibility, rigid foldability, and design algorithms. Part 2 focuses on the connections between origami and more applied areas of science: engineering, physics, architecture, industrial design, and other artistic fields that go well beyond the usual folded paper. To learn how to make a trisected bowl, click here. Undergraduate and graduate students and research mathematicians interested in origami and applications in mathematics, technology, art, and education.